Nintendo has said its next major Mario game will go on sale on 27 October. The date means the firm will be able to promote Super Mario Odyssey alongside its new Switch console in time for the Thanksgiving and Christmas shopping seasons. The news was revealed at the end of a pre-recorded video stream broadcast to coincide with the start of the E3 expo. Nintendo hosts demos at the Los Angeles gaming event, but has not held a large press conference there since 2012. The Japanese company recently reported a surge in profits thanks to the release of the Switch, which went on sale in March. The company sold more than 2.7 million units of the device – which doubles as a handheld and desktop machine – in its first month. That made it the firm’s fastest-selling hardware product in the US. Nintendo told investors at the time that it now hoped the console would match the success of the Wii, of which more than 100 million units were sold before production was discontinued in 2013. “Zelda: Breath of the Wild has got the Switch off to a great start, but it’s not until a Nintendo console has a proper Mario game that they can call it a proper success,” commented Katharine Byrne, news editor of the games trade magazine MCV. “Releasing it ahead of Christmas is a good idea because if people haven’t bought the console yet then offering it with a Mario game is a strong proposition. “The Mario games on the Wii U slightly disappointed because everyone had been hoping for a successor to the original Wii’s Super Mario Galaxy titles, and Super Mario 3D World didn’t hit the same levels. New gameplay from the title showed Mario and his cap – which now acts as an autonomous flying character – in a range of scenarios including a clash with a Tyrannosaurus Rex dinosaur, a visit to a Mexican-themed land and a situation in which the plumber is transformed into a saucepan-wielding turtle. 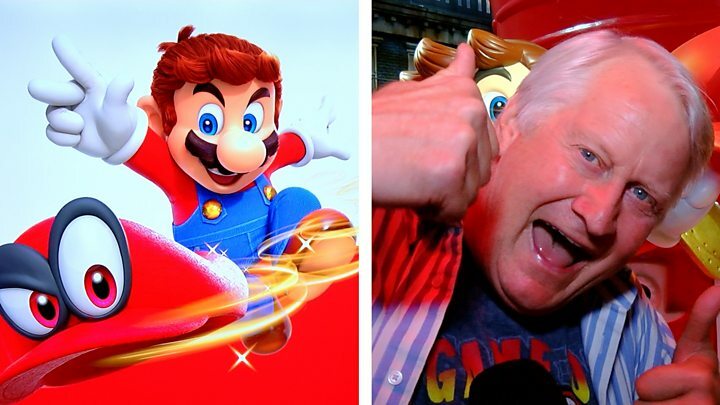 Mario fans were also told they would be able to play a new role-paying title by France’s Ubisoft – Mario and Rabbids Kingdom Battle – which will be released in August. In addition, it was announced that a new Pokemon-themed role-playing game was in development, as is a fourth major entry to the Metroid Prime sci-fi adventure series. “Metroid Prime 4 is something that Nintendo fans have been clamouring for for ages, so it was a nice just to be able to say it is coming,” commented Ms Byrne. “I think some people would have also expected news of a port of Super Smash Bros for the Switch, but personally I wasn’t surprised that it wasn’t discussed. Finally, Nintendo is fleshing out the games line-up for the Switch – and it has whipped out some of its most popular characters to do it. Last year, the company only had one big game to show off at E3 – but now Nintendo fans have games featuring Mario, Yoshi and Kirby to look forward to. The arrival of smash hit Rocket League shows that third-party developers also see the Switch as a viable marketplace for their games. Players have been gagging for a full Pokemon game on the Switch and finally one was announced – although it’s still “coming soon” and we don’t know exactly what it will be. Hotly anticipated new titles such as Mario Odyssey are still months away, with this summer’s releases such as Pokken Tournament DX and Splatoon 2 retreading old ground. And there are still some Nintendo franchises missing from the line-up, including Animal Crossing. There’s a lot for fans to be excited about – it’s just going to take months for them to get their hands on the games.